Coolaroo Outback Sesame Sun Shades are made of knitted of PVC coated all-weather polyethylene fabric that keeps out up to 80% of UV rays, yet allows air through. That combination reduces the indoor temperature, and also allows some light to filter in so you can keep an eye on the outside. 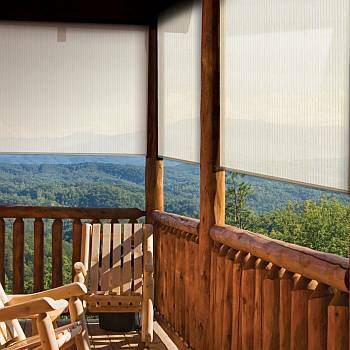 Outback shade fabric stops the sun's heat before it strikes your window, thus reducing the heat transfer. As a result, your home or business stays cooler. Reduces room temperatures up to 25 degrees when mounted on the outside of the window, which can save 20-25% in cooling energy costs. This style is available in 4ft, 6ft, 8ft and 10ft widths. These are the same sun shades as the Custom Solar Shades and are available in 6 and 8 foot widths (fabric width). All of the stock Outback shades are 6 feet tall. Block the sunlight, but not your view. Protection from prying eyes is an additional benefit, allowing you the utmost in daytime privacy (under most conditions) you will be able to see out, but no one can see in. This is not a blackout shade as some light will filter through. All stock size Outback window shades are measured by width of the fabric on the roll. The brackets will add 2-3/4th inches to the overall width. Brackets are easily configurable to work for ceiling (top mount), wall (side mount), or end (inside) mounting. You can even choose which side of the shade the crank end will be. Shade will protrude 3 inches from the mounting surface. You will need at least 2-1/4in tall plus its width to mount the shade. The roller clutch mechanism design provides a smooth action to easily raise or lower the shade. Bungee "Tie-Downs" come in the bottom rail so you can easily secure your blind especially during those breezy days. A valance in not included nor available for these stock shades. They are backed by a 3 Year Warranty. Filters light and air - you still get sunlight and breeze!